Finally, some good news on the Dakota Access pipeline: the Obama administration will not allow the project to move forward. In a statement, the U.S. Army Corps of Engineers announced it will not be granting the easement needed to complete the pipeline at this time. Additionally, an environmental impact statement will be conducted to explore alternative routes for the project. "The best way to complete that work responsibly and expeditiously is to explore alternate routes for the pipeline crossing," Jo-Ellen Darcy, the Army's Assistant Secretary for Civil Works, said in a statement. Standing Rock Sioux Tribal Chairman Dave Archambault II applauded the move. "Throughout this effort I have stressed the importance of acting at all times in a peaceful and prayerful manner – and that is how we will respond to this decision," he said in a statement. "With this decision we look forward to being able to return home and spend the winter with our families and loved ones, many of whom have sacrificed as well." The news comes alongside reports that 2,000 U.S. military veterans arrived on the site today to act as "human shields" for the activists as part of a group called Veterans Stand for Standing Rock. The Army Corps of Engineers had advised opponents of the pipeline to leave the site or risk violent confrontation about a week ago. 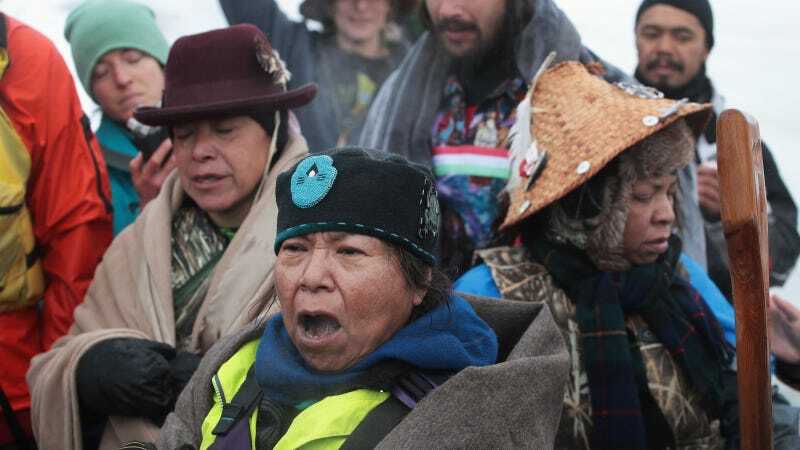 “In the ultimate expression of alliance, we are there to put our bodies on the line, no matter the physical cost, in complete nonviolence,” the group Veterans Stand for Standing Rock wrote in a document outlining its mission. The announcement from the Army Corps of Engineers is a victory, but rerouting the pipeline is far from a done deal. The statement from the Archambault II of the Standing Rock Sioux Tribe urges the Trump administration to "respect this decision and understand the complex process that led to this point." Last week, Trump made clear he supports the pipeline and wants to see the project completed.